New Zealand mills producing sawn timber from unpruned logs report domestic sales ranging from below last year to the same as last year. Their export markets are strong, although there is some price pressure for sales of untreated lumber into Australia due to the increased supply from Scandinavia. The cut-of-log (COL) export sales are also stagnant. This is the section of the log that doesn’t meet structural specifications but is too good for industrial grades. Mills supplying export markets have incurred recent increases in shipping due to ‘Emergency Bunker Surcharges’ and ‘Operation Cost Surcharges’ ranging from $80-$120 USD per 40-foot container. Base container shipping prices are expected to increase in Q3. Sales in the China log market have dropped from last month, but the current daily port off-take is still a solid 65-70,000m3 and softwood log inventory has continued to drop to around 3.7Mm3. Sale prices in China increased by $1-$2 USD for the month. Shipping costs increased on average $2-$3USD/JASm3. The Indian market remains subdued. At-Wharf-Gate (AWG) prices received for export logs in June increased by $3-$4/JASm3 depending upon the grade and length. Increases were highest for pruned logs and the lower grade industrial logs. This increase in AWG prices seems to be due to aggressive buying at the wharf by log exporters. 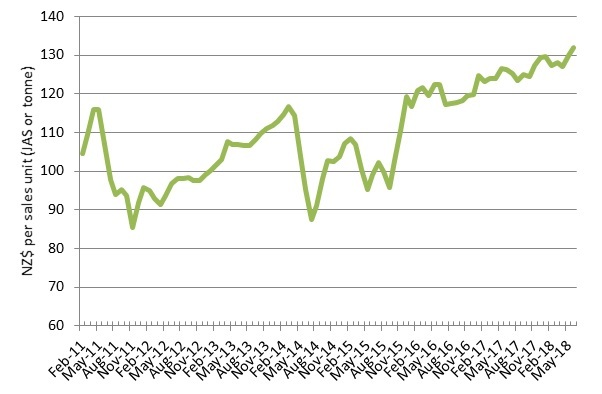 Due to the increase in AWG prices for the export logs, the PF Olsen Log Price Index increased by $2 to a record high of $132 for June. (See PF Olsen Log Price Index below). The Index is currently $11/m3 above the three-year average. The domestic demand for clear sawn timber remains steady apart from the decking sector. Houses are now built on smaller sections, with more outdoor concrete pads rather than the traditional ¼ acre section with the large deck. Market commentators think this trend will continue as housing intensification continues, and more apartments are built which don’t have wooden decks. Demand from the USA and European markets for clear lumber continues to be strong despite some recent declines in new housing starts. Home repairs and remodelling remain strong however, and therefore product sales through the ‘big box’ stores are unaffected. Log supply is mixed with some mills relatively flush and others struggling to get enough logs to run at full capacity. Mills producing solid structural timber report steady sales of structural timber whilst still down from last year. It has been noted that engineered products like LVL and Glulam have taken market share from solid timber, but this won’t account for all the slowdown in sales. Domestic sales of industrial grades continue to be very strong. Sales to the Australian market are solid apart from untreated timber in which there is some price pressure due to timber arriving from Scandinavia. The Asian markets for non-pruned timber are strong except for the cut-of-log ‘COL‘ grade. This is the timber that is cut from the log that is not suitable for structural but too good for industrial. It is often sold with sound pith included, but some more specific grades can be agreed between buyer and seller. Industrial sales are very strong, and some of this demand is driven by mills seeking to reduce input costs by buying industrial rather than COL grade. These are generally the mills in China that are struggling with the transition to more mechanised production and increasing labour costs. The OIO has granted consent for Daiken Corp to buy MDF (medium density fibreboard) manufacturer Dongwha, south of Mataura. The OIO is satisfied the business merger will not substantially lessen competition in the construction materials supply market. Korean-owned Dongwha was 80% owned by Dongwha International Co, a Hong Kong incorporated company, and 20% by Laminex Group, a division of Fletcher Building. The Southland plant is the fourth MDF facility owned by Daiken and the second in NZ. Daiken acquired the Rangiora MDF facility in 2009, initially in a joint venture. Shipping companies have recently added ‘Emergency Bunker Surcharges’ and ‘Operation Cost Surcharges’ ranging from $80-$120 USD per 40-foot container. The initial surcharges were around $80USD, but since the larger players have posted a $120USD surcharge everyone seems to have followed. Due to recent changes there will be less direct-shippers on the Trans-Tasman line with more trans-shipping occurring. Base prices are expected to increase in Q3 and Q4. How much this affects New Zealand mills will depend upon how long they have fixed their container shipping costs. Sales in the China log market have dropped from last month, but the current daily port off-take is still a solid 65-70,000m3 and softwood log inventory has continued to drop to around 3.7Mm3. The daily off-take of logs has reduced, as there is a general slowing of activity caused by reduced work hours in the hotter summer temperatures. Business in Qingdao was also either slowed or halted up till and during the Shanghai Cooperation Organisation (SCO) summit to improve air quality. The focus of the summit is Eurasian politics, economics and security. The SCO is the largest regional organisation in the world by population as it now includes China, Russia, India and Pakistan amongst others. Sale prices in China increased by $1-$2 USD per JASm3 for the month. The price of an A grade log is currently $143-$145USD per JASm3. Shipping costs have firmed up by 2-3 USD per JAS m3 and the cost of shipping from NZ-China is now in the low $30’s USD per JASm3. The labour shortage referred to in last month’s Wood Matters has continued, and combined with the heat wave in the north- where temperatures approach 450- means sawmill production is still not at full capacity. Due to this slower production the sawn timber prices are up between Rs 501-521 per cubic feet lumber. This is much better than Rs 481/cft about 4-6 weeks ago. However, sawmills are stocking less inventory with the premise that they don’t have funds to block in advance payment of GST as the inventory moves slower due to labour shortage. The labour shortage is expected to alleviate in 1-2 months. 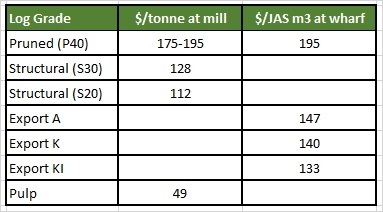 The Indian log market has remained subdued with prices for an A grade log in the $159-160 USD per JASm3 range. Ocean freight from NZ to India ranges from $41 to $44/JAS USD per m3, and 1 USD remains in range of 67 to 68 Indian Rupees. Usually with July-August being the monsoon/rainy season this is a very dull time for the industry but the current year stock levels being low, currently in Kandla about 120,000 m3, there will not be much change in the market. Average monthly import levels in Kandla for NZ Logs have now dropped down to 125,000 JAS m3 per month from traditionally 145,000 – 150,000 m3 per month YOY basis. We expect the old demand levels to come back by early 2019. The south India market serviced from Tuticorin remains flat but is in a lean stock position currently. This market as usual is catering to the industrial packaging sector. Recently the market has received a lot of supply in 3.6m/3.8m logs, and buyers are looking for a respite and seeking longer India based lengths of 4.8m/5.4m/6.0m. This packaging industry continues to be the demand leader for NZ radiata pine logs. We now see some active inquiries and activity picking up around real estate/infrastructure related construction. Elections occur in one year and some forecasters predict the party in power at the centre – BJP - will pump more expenditure into infrastructure and low-cost housing projects to provide a feeling of prosperity and growth and get votes in 2019. This may mean a quick boost in demand in Q4 for NZ radiata pine logs. Due to recent hiccups in US-China trade relations, many container shipments of southern yellow pine from the South East of the USA have been diverted to India at lower prices, and this has affected the softwood log market supply. The complete result of this is yet to unfold. While ocean freight costs for break bulk cargo has increased in the last month the increases have not been as significant as container shipping. Over the last month shipping to China increased by an average of $2-$3 USD per JASm3 and shipping to India increased by an average of $2-$4 USD per JASm3. The Baltic Dry Index (BDI) is a composite of three sub-indices, each covering a different carrier size: Capesize (40%), Panamax (30%), and Supramax (30%). It is an Index from 20 shipping routes. Whilst most of the NZ log trade is shipped in handy size vessels, this segment is strongly influenced by the BDI. The graph below shows the recent surge in the BDI. Over the last month the NZD has ranged between 0.6863 and 0.7038 USD. Due to the increase in price for export logs, the PF Olsen Log Price Index increased by $2 to a record high of $132 for June. The index is currently $7 higher than the two-year average, $11 above the three-year average, and $18 higher than the five-year average.